About Jenny | Bloggin' White Now !………. Jenny is a wife, a mother and a true business leader offering a difference that is hard to beat. With arguably the most recognised website within the NSW Club, Casino and Gaming Industry (www.whitenow.com.au) and one of the most well known names within the Hospitality Sector, Jenny’s marketing expertise are quite obviously exceptional ! Jenny has always seen things from slightly ‘left of centre’ and it is this amazing eye for business and her ability to provide great levels of professionalism and service all whilst having a joke that has made her a very successful business owner. 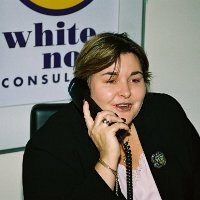 Jenny has been operating Recruitment Agencies and Recruitment Businesses for over 20 years with White Now being at the forefront for the past 18 years. Jenny has completed a number of degrees including a Bachelor of Education, Diploma of Applied Science (Orthoptics) and HR Studies which she has drawn upon in the past to develop fun, experiential development programs. Jenny spent many years in Club and Pub operations with over 15 years of working in Clubs under her belt. A little known secret is that Jenny was also a primary school teacher and spent a number of years in both public and private schools educating the minds of kids aged 5 to 12. Those kids are now all adults and hopefully would remember the fun times that they had as Jenny as their teacher ! Jenny owns the White Now brand and leads her team in a passionate, innovative and fun way. You can contact Jenny through jenny@whitenow.com.au or on +61 2 9807 1806.